Happy Tuesday! I ran a little more than 4 miles last night. It was snowing and quite lovely outside. I ran the first two miles as a speed challenge and was able to maintain an 8 minute mile for both of them. Picking up the pace is getting a bit easier! I stopped by a buddy’s house and we ran another 2 miles to a cute little cafe/pub and she had a beer and I had a glass of wine. Then we jogged a slower mile home. It was a very fun way to celebrate the end of a Monday. Tonight I am going to Zumba class, and while I have kept up with running several times a week, I am looking forward to getting some exercise in the warm indoors! I feel good right now. I feel strong. My leg muscles are becoming much more defined and my core is stable. I don’t get achy the day after running–even after my long-runs. I know this might change once I start bumping up mileage in preparation for the marathon, but I am soaking up these current feelings of accomplishment. The first half marathon I ran seemed like a crazy idea, before, during, and after. The second half was marginally less crazy, but the distance was still mind-boggling. You know what? 13 miles does not seem crazy to me anymore. I did 8 on Sunday and went about the rest of my day like a regular person. I’m noticing that my weeknight 3-miler has been replaced by a 4-miler. I just feel comfortable running a bit longer and a bit further. 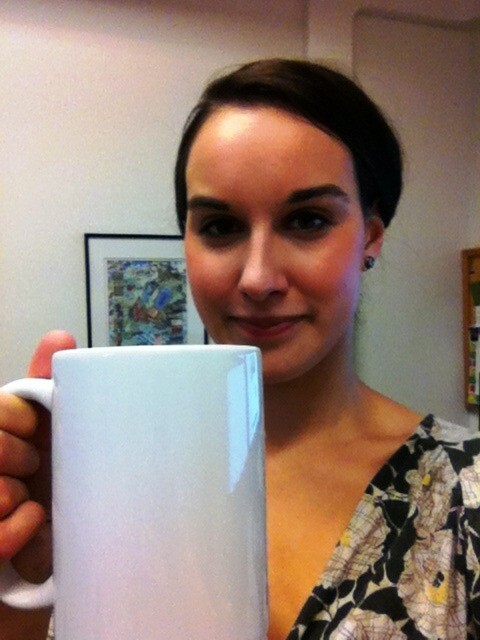 Tuesday is a great day to break out my coffee mug that is as big as my head. It’s actually filled with water. Aren’t you proud of me? I’ll be doing my third marathon in April and the 26.2 mile distance still scares me ! Lol, It’s a blooming long way ! Good progress and keep to the plan, the weathers nots helping anyone at present but switch to trail running in the snow, all good endurance training.